The Neo Political Cowgirls (NPC) are performing their summer fundraiser production of EVE on Wednesday, July 31 and Thursday, August 1 at 8 pm at LTV Studies at 75 Industrial Road in Wainscott, NY. Sag Harbor, NY – July 25th, 2013 – The Neo Political Cowgirls (NPC) are performing their summer fundraiser production of EVE on Wednesday, July 31 and Thursday, August 1 at 8 pm at LTV Studies at 75 Industrial Road in Wainscott, NY. A portion of the proceeds to benefit Bay Street Theatre. Tickets are priced at $55 for both evenings. 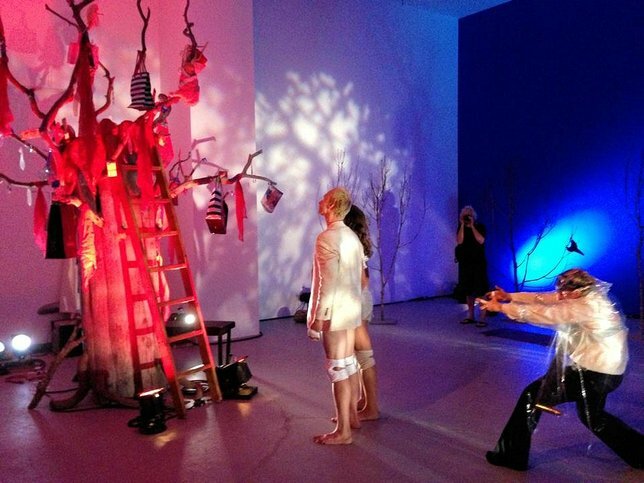 EVE is a unique theater experience including dance theater immersion, a bath of music, story and art. The audience moves freely at-will through 13 rooms following various performers. NPC’s mission statement is to be ART IN ACTION, helping the community use art as a form of bringing awareness and fundraising to everyone. EVE will run for two weeks with both night helping to raise funds for Bay Street Theatre and other east end non-profits. Visit npcowgirls.org to purchase tickets. Group sales receive a discount. Tickets for the fundraiser nights are $55. For information about Bay Street Theatre, log on to www.baystreet.org or call the Box Office at 631-725-9500. Bay Street Theatre is a not-for-profit institution presenting new, classic and contemporary works with a commitment to challenging and entertaining our diverse community. This commitment extends to educational programs for all ages to foster the continued value of theatre as a vital art form for future generations. Halloween Thrills & Chills, The LI Women's Expo, News & More in October 12's Newsletter! Subject: LongIsland.com - Your Name sent you Article details of "The Neo-Political Cowgirls Perform Their Highly Acclaimed Hit 'Eve' To Benefit Bay Street Theatre"